What happens when you mix a Cavalier King Charles Spaniel and a Bichon Frise? You get this adorable, hypoallergenic pup! 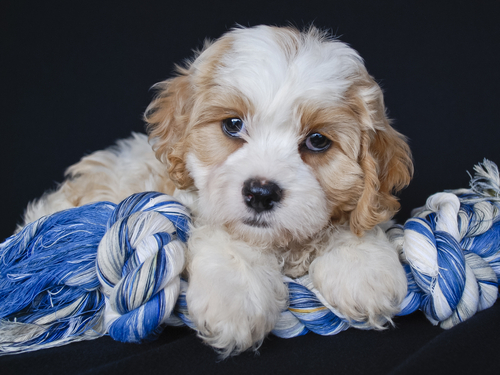 A Cavachon is a highly desired mixed breed as they have an amiable, playful personality and low exercise requirements, and they dont shed much, if at all. They are a versatile companion for older families or homes with children since they are known for their gentle and affectionate nature. Physical and temperamental traits depend on the breeding of the parent dogs. 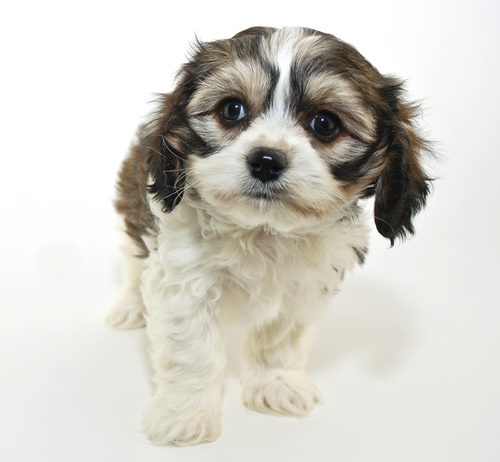 A Cavachon is a small dog with an average weight between 15 and 35 pounds. Their medium-length coats are typically wavy or silky. 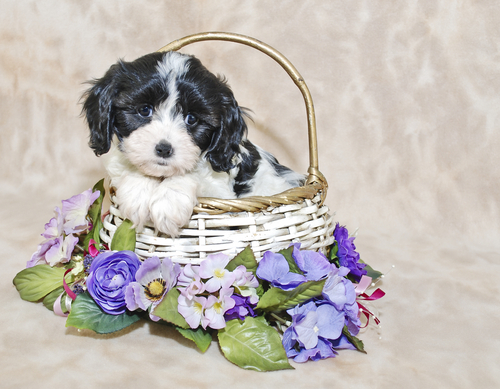 A Cavachons coat can have a range of coloring, such as peach, peach and white, sable and white, tri-colored, black, and tan. Height (Male) 10 - 13"
One of the best perks of a Cavachon is that even though are a high-energy pup, they only need around 30 minutes of exercise per day. As mentioned earlier, their temperament will range, but most Cavachon puppies are friendly and playful when socialized early on. They are known for being accepting and tolerant, which makes them a great choice for homes with children or other pets. Its important to train your Cavachon puppy, and the earlier you start, the more effective the training will be. This helps diminish the risk of them developing bad habits. However, their silky coat does require regular grooming and occasional trimming to avoid a matted, dirty coat. Since a Cavachon has hair that grows inside of their ears, they are susceptible to ear infections, so be sure to clean them on a weekly basis! Other health risks in Cavachon dogs include heart murmurs, flea allergies, and eye irritation due to hair rubbing their cornea. Remember that even if your dog doesnt scratch the wall out of boredom, its best to give them adequate exercise, active playtime, and attention. Since Cavachons are such an affectionate and caring breed, they form close bonds with their owners and crave your attention. The kennel still breeds Cavachon puppies on their farm, and takes pride in coining the name Cavachon! Sometimes they are referred to as a Bichalier, but Cavachon is the most commonly accepted name for the breed.